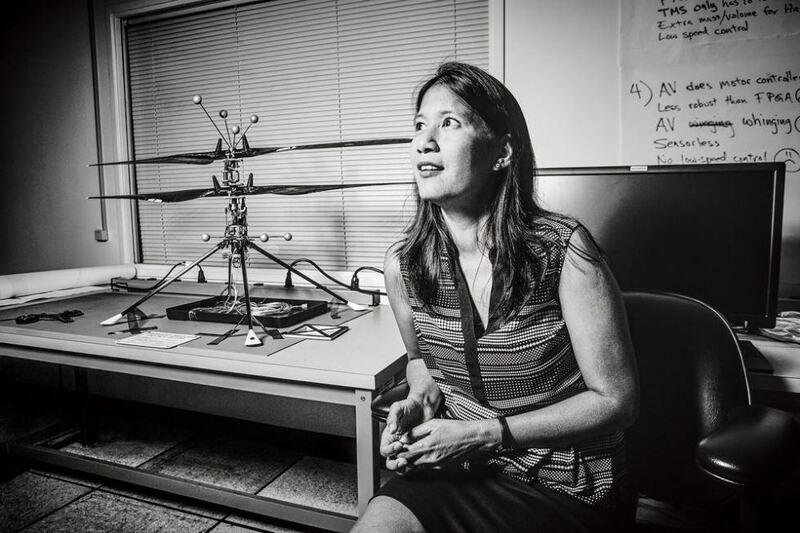 In November 2015 I wrote about an idea to fly a robotic drone helicopter on Mars as a part of the next rover mission, currently referred to as the Mars 2020 mission. On May 11th, 2018, NASA confirmed that Mars 2020 will now include the drone, to be carried by the rover as a technology demonstrator. The unit, under development since 2013, is quite small; the body is the size of a box of tissues, and the contra-rotating rotor blades have a diameter of a metre (39 inches). Weighing some 1.8 kg (4.4 lbs), the drone will be battery-powered, using solar cells to recharge the batteries, which will also power a dedicated heating source to help it survive the cold Martian nights. The drone will be carried underneath the rover, which will used the same “skycrane” landing mechanism as the Mars Science Laboratory (MSL) rover Curiosity. Once a suitable location for its deployment is found, the rover will lower it to the ground and move away to let the drone commence its first flight. Up to five flights are planned over a 30-day test campaign. The first will be very short-duration, enough to allow the helicopter to ascend to around 3 metres (9 feet) and hover for 30 seconds while the flight systems are checked out. Later flights will last up to 90 seconds and travel as far as a few hundred metres before landing to allow the solar panels to recharge the battery system. Flying any sort of aircraft on Mars is a significant challenge. For example, the atmosphere of Mars is only one percent that of Earth, or the equivalent of being 30 km (100,000 feet) above the surface of the Earth – more the double the altitude any helicopter has been able to fly. This means the drone has to be both very lightweight and extremely powerful for its size if it is to get airborne on Mars. To make it fly at that low atmospheric density, we had to scrutinize everything, make it as light as possible while being as strong and as powerful as it can possibly be. To achieve lift, The helicopter’s blades will rotate at up to 3,000 revolutions per minute, 10 times the rate of a terrestrial helicopter. The vehicle is also entirely autonomous – the time delay in Earth-Mars-Earth communications means that conventional drone flight under human control is impossible. Instead, flight parameters will be uploaded to the Mars 2020 rover for relay to the helicopter, which will also be able to receive and act on additional instructions sent by the rover so that it doesn’t have to carry the entire flight plan within its own computer. 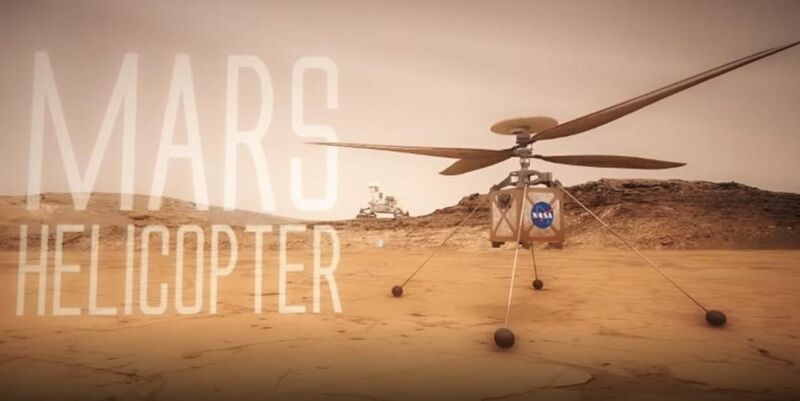 NASA sees Mars Helicopter as demonstrating how aerial vehicles might serve as scouts for future missions to Mars. This idea is explored in the most recent video promoting the mission, with a helicopter scanning and image the terrain around a rover. The ability to see clearly what lies beyond the next hill is crucial for future explorers. With the added dimension of a bird’s-eye view from a ‘marscopter,’ we can only imagine what future missions will achieve. 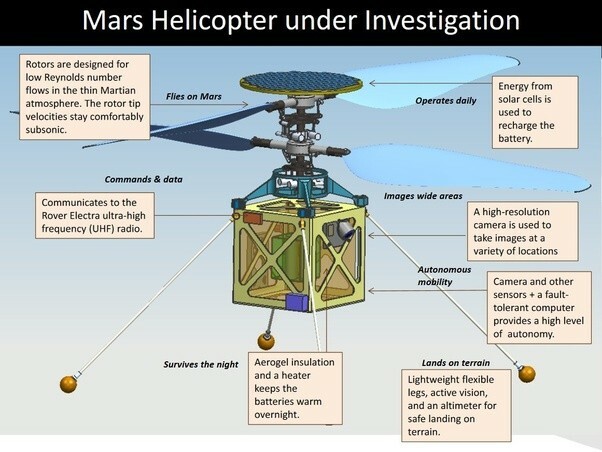 As a technology demonstrator,the Mars Helicopter is seen as a high-rick project, although NASA has been keen to stress that if the helicopter fails for any reason, it will not impact the overall Mars 2020 mission. Nevertheless, the news the project will be carried on the rover mission hasn’t been positively received in all quarters – including within the Mars 2020 mission itself. I am not an advocate for the helicopter, and I don’t believe the Mars 2020 project has been an advocate for the helicopter. The concern among the rover science team is that the helicopter’s planned 90-day test campaign will prove to be a disruption in the rover’s overall science mission. However, Farley also indicated that the rover team are working to integrate the helicopter into the rover’s mission and accommodate its requirements. Could Lunar Dust Be Deadly to Astronauts? The United States and other nations are developing plans to establish a long-term presence on the surface of the Moon. To do so, many challenges have to be faced, not just technologically, but also in terms of the health and welfare of the men and women working on the Moon. Where health is concerned, the biggest risk has always been seen as protecting humans from the amount of radiation – solar and cosmic – striking the Moon, which has no atmosphere and almost no magnetic field to offer any protection. However, a new study suggests there is an even greater health risk present on the Moon: the lunar dust itself. Bombarded by meteors and micrometeorites for billions of years, the surface of the Moon is covered by a layer of exceptionally fine, bone-dry and electro-statically charged dust called regolith. This tend to stick to almost anything it comes into contact with – including space suits and equipment, as demonstrated during the Apollo missions of the 1960s and 1970s. This dust is exceptionally difficult to remove from space suits. When brought back inside the Lunar Excursion Modules, it caused several of the Apollo astronauts to experience sinus issues, and to exhibit symptoms akin to hay fever, including sneezing, watery eyes and a sore throat. While relatively short-lived – the problems cleared up once the astronauts were back on Earth – they caused a medical team at the Stony Brook University School of Medicine, Stony Brook, New York, to wonder what hazards long-term exposure to lunar dust might present for humans, a field of study not widely considered in planning for human missions to the Moon. Their findings are a startling read, suggesting that routine exposure to lunar dust could be deadly for those spending extended periods on the Moon. Building on previous studies into the effects of breathing dust from volcanic eruptions, dust storms and coal mines, which can cause a range of health issues from eye irritation and wheezing through bronchitis to DNA damage which can lead to cancer, the Stony Brook team set out to see what damage might result from inhaling lunar dust. To do so, they simulated lunar regolith using dust samples from Earth that resemble soil found on the Moon’s lunar highlands and volcanic plains, ground to a fine powder. Human lung cells and mouse brain cells were then exposed to the dust. The result? Up to 90% of the human lung cells and mouse neurons died when exposed to the dust samples, which also caused significant DNA damage to mouse neurons while the human lung cells were so extensively damaged, it was impossible to measure any underlying DNA damage. 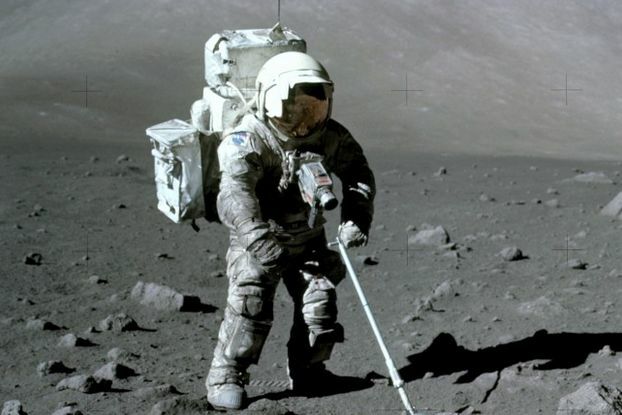 These results suggest that breathing even minute amounts lunar dust could pose a serious health hazard to those on the Moon unless substantive mean to mitigate dust contamination of living spaces can be found. The problem here is that the regolith is such a fine powder (another name for it is “Lunar Fines”), that it will be next to impossible to prevent it eventually making its way inside lunar living spaces, and into the lungs, eyes and ears of the people inhabiting them. That said, there are some ideas for at least trying to reduce the amount of dust that might be carried back inside a vehicle or living module. One of these is the idea of the “suit port”. This is effectively a space suit mounted on the outside of a living module or vehicle, complete with its own mini “airlock” built into the back pack. An astronaut using the suit climbs into it from the back, and when buttoned-up inside, a cover is sealed over the suit’s back pack to maintain the integrity of the living space before the astronaut detaches the entire suit to perform surface activities. Suit ports minimise the amount of dust being exposed to interior surfaces of a vehicle / living module, and helps contain the amount of an EVA suit that must be cleaned when an astronaut returns from surface activities, as the main bulk of the suit is always kept outside. However, suit ports aren’t a perfect solution; they are mechanically more complexity than other suit types, potentially reducing their overall reliability while increasing the need for routine checks on their integrity, etc., all of which could mitigate any advantage gained in their use. 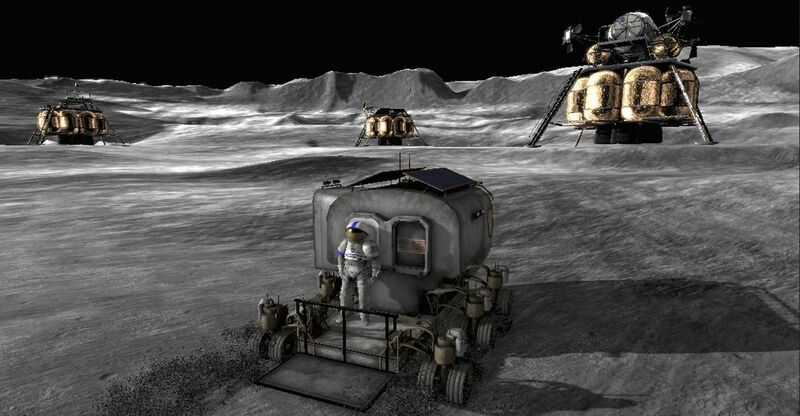 As it is, the Stony Brook report highlights the fact that if humans are going to live and work on the lunar surface, there are some significant issues beyond those which have up to now been under consideration by space agencies, and which will have to be addressed if undue health risks are to be avoided in a return to the Moon. Jupiter’s icy moon Europa has for the last several decades been the subject of intense speculation concerning its potential to harbour both a liquid water ocean and life within that ocean – as I’ve often referenced in these pages. The evidence for Europa being home to a liquid ocean is pretty convincing; for example, in 1997, the Galileo spacecraft, making a routine flyby of Europa during its mission around Jupiter, passed through a plume of water vapour almost 1600 km thick. Given the amount of gravitational tidal forces acting on Europa courtesy of Jupiter and the other Galilean moons orbiting the gas giant, it is entirely possible any ocean on Europa is heated by hydrothermal vents on the sea floor – which may also offer small havens of heat and chemicals where microbial live might thrive. 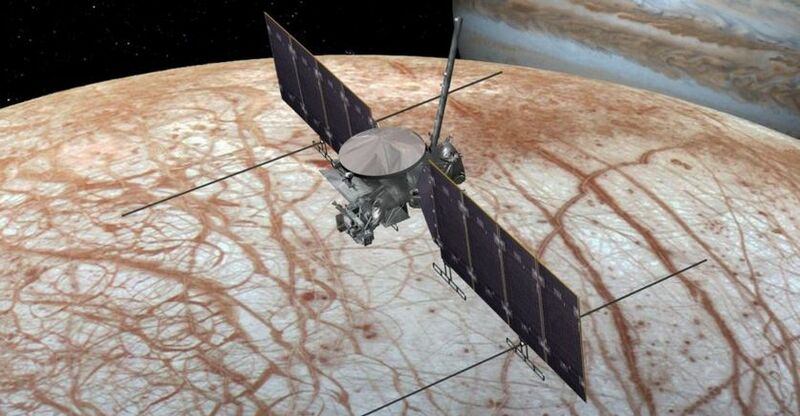 Given all this, scientists are understandably keen to find out more about Europa, and NASA’s NASA’s proposed Europa Multiple Flyby mission (also called Europa Clipper) has been seen as a key part of meeting this desire. However, the mission hasn’t been especially popular with the White House, and has depended on Congressional support to remain afloat. This support continued on May 9th, 2018, when a House funding bill approved by the commerce, justice and science (CJS) subcommittee approved a US $21.5 billion budget for NASA in fiscal year 2019, with US $545 million of that budget being specifically targeted by the bill for the Europa mission and it’s proposed follow-up which will attempt to place a lander on the surface of Europa. This is doubly significant, as recent NASA budgets have completely ignored the lander mission. The funding means that the Multiple Flyby Mission remains on course for a 2022 launch, and will be able to complete some significant milestones this year. If funding continues, the lander mission could fly in 2025. Following the successful first launch of the Block 5 variant of the Falcon 9 rocket – the last and most powerful version of the booster – SpaceX has announced an ambitious goal for 2019. To launch a Falcon 9 rocket, recover the first stage and complete check-out and refurbishment of that stage and then re-launch it as part of another Falcon 9 mission within 24 hours of the initial launch. We intend to demonstrate two orbital launches of the same Falcon 9 vehicle within 24 hours no later than next year. That will be, I think, truly remarkable to launch the same orbit-class rocket twice in one day. While perhaps it may be taken as a publicity stunt, SpaceX views the ability to relaunch the same first stage in a single day as boosting their claim that a used rocket is more reliable than a new one. This is a claim they have frequently made in reference to air travel, where they point out people instinctively feel safer flying an aircraft that has already had hundreds of hours in the air, rather than stepping aboard a completely new, unflown aeroplane. The company also remain committed to making the Falcon family a fully reusable system. Attempts to recover the payload fairings will resume this year, while the company will also start adding thermal protection to Falcon upper stage over the course of the next 12 months so they can start gathering flight and performance data on upper stages carrying such protection, although any first attempt to try to recover an upper stage still remains a longer-term goal. 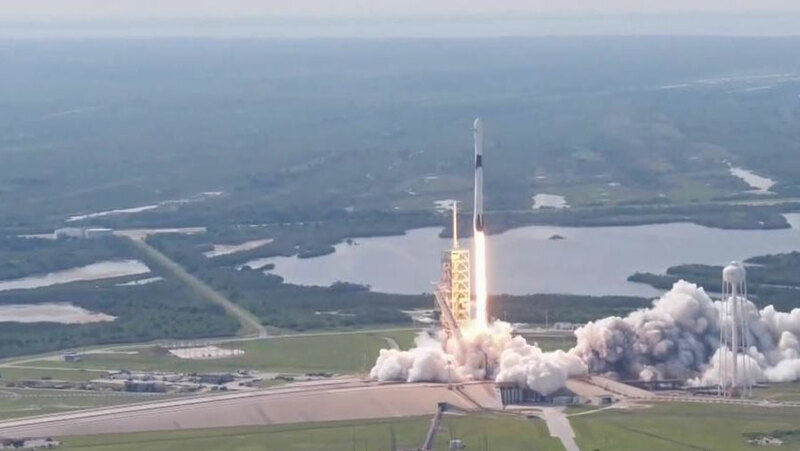 In the meantime the first flight of the Falcon 9 Block 5 rocket successfully delivered the first Bangladeshi geostationary communications satellite, Bangabandhu Satellite-1, to orbit, and saw the first stage of the launch vehicle make a successful landing on the autonomous drone ship Of Course I Still Love You, marking the 25th successful recovery of a Falcon 9 first stage.